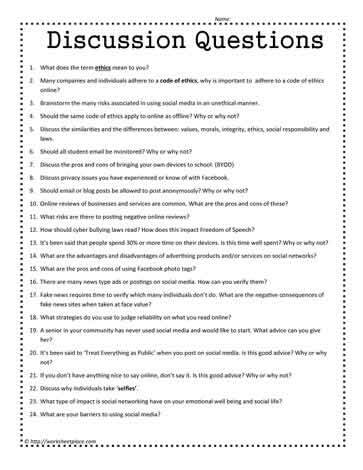 Discussion questions for social media for middle school grades. What does the term ethics mean to you? Many companies and individuals adhere to a code of ethics, why is important to adhere to a code of ethics online? Brainstorm the many risks associated in using social media in an unethical manner. Should the same code of ethics apply to online as offline? Why or why not? Discuss the similarities and the differences between: values, morals, integrity, ethics, social responsibility and laws. Should all student email be monitored? Why or why not? Discuss privacy issues you have experienced or know of with Facebook. Should email or blog posts be allowed to post anonymously? Why or why not? Online reviews of businesses and services are common. What are the pros and cons of these? What risks are there to posting negative online reviews? How should cyber bullying laws read? How does this impact Freedom of Speech? It?s been said that people spend 30% or more time on their devices. Is this time well spent? Why or why not? What are the advantages and disadvantages of advertising products and/or services on social networks? What are the pros and cons of using Facebook photo tags? There are many news type ads or postings on social media. How can you verify them? Fake news requires time to verify which many individuals don?t do. What are the negative consequences of fake news sites when taken at face value? What strategies do you use to judge reliability on what you read online? A senior in your community has never used social media and would like to start. What advice can you give her? It?s been said to ?Treat Everything as Public? when you post on social media. Is this good advice? Why or why not? If you don?t have anything nice to say online, don?t say it. Is this good advice? Why or why not? Discuss why individuals take ?selfies?. What type of impact is social networking have on your emotional well being and social life? What are your barriers to using social media?